Savannah Guthrie shares a photo of her daughter's precious curls in her latest Instagram post. It's all about the curls! 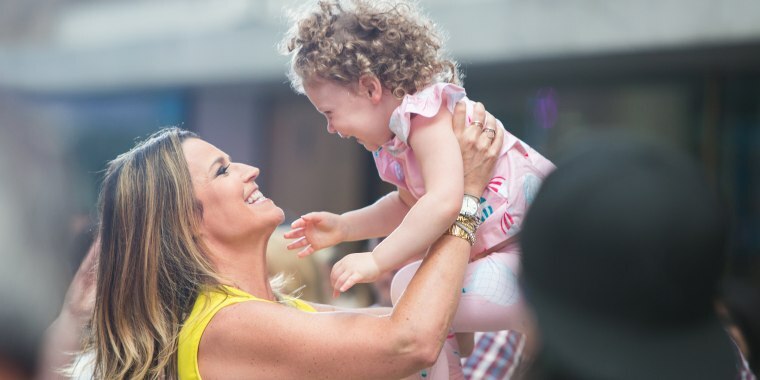 With her most recent post, Savannah Guthrie has made it perfectly clear that she'll be encouraging her daughter, Vale, 3, to embrace her natural beauty and curly hair. "Curls for days," Savannah wrote on Instagram, adding the hashtag #toddlersofinsta. In the photo, Vale's hair is pulled into a cute, high ponytail with spirals and ringlets surrounding her face. In a letter to Vale, which she wrote for "Love Your Body" week in 2017, the TODAY anchor mentioned her daughter's sweet curls specifically as a trait she should cherish. "I love your crazy golden curls, your gigantic blue eyes, your sweet cheeks and that super-wattage smile that lights up the world," she wrote. Savannah also mentioned her toddler's hair in another post, but, unfortunately, it was when Vale had gotten herself into quite the pickle by rubbing Aquaphor and Vicks VapoRub into her curls. Dear Internet, let's say, hypothetically, your toddler put Aquaphor and Vicks VaporRub on her hair. How do we get it out? Luckily, social media came to the rescue as moms shared their go-to tips and tricks. Dish-washing soap was the (mostly) magic cure! It looks like both mom and daughter were having a lot more fun in the most recent photo — and we're so glad Savannah shared it with us!